Fitted will release the Support Local Surfing New Era trucker hat this Wed, Dec. 22. This collaboration from Fitted and surf photographer Zak Noyle is a limited edition piece: 80 caps will be available in the store and 50 will be available online at FITTED. 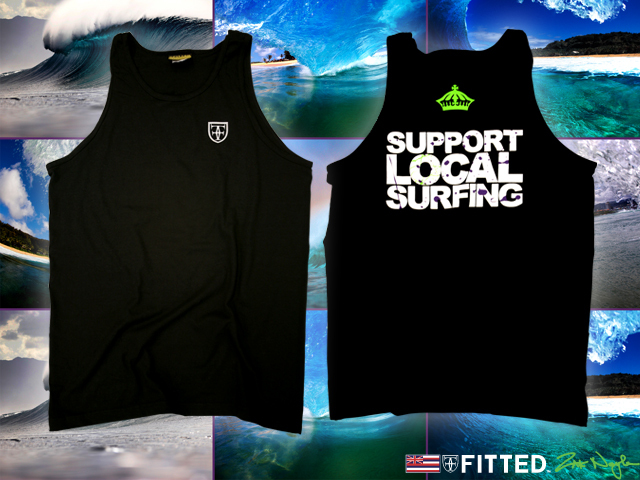 There is also a matching tanktop with the Support Local Surfing New Era– 30 tanktops available in store and 20 available online at FITTED. The first person to purchase the hat from the store and online store will receive a framed signed Zak Noyle photo. Part of the proceeds from this hat will go to Nā Kama Kai. Nā Kama Kai is Hawaiian for “Children of the Sea” and promotes the Waterman lifestyle to the youth as opposed to just surfing lessons. The non-profit organization holds free waterman clinics where children are able to interact with prominent members of the surf, canoe paddling, paddle boarding and swim communities. The main objectives for the Na Kama Kai events are to expose children to the Hawaiian culture and the benefits of a healthy lifestyle around ocean activities. More info at Novus Swell. Zak Noyle is one of the most talented water photographers at the Banzai Pipeline today. The 25-year-old regularly swims out to the world’s most deadly wave to capture mind-blowing images. He is a staff photographer for Surfer Magazine and photo editor of Innov8. His dad, Ric, is a successful commercial photographer. Ric forced his son to shoot with film in the beginning. As a result, Zak sharpened his skills behind the lens the old-fashioned way. He is not your average surf shooter. Zak Noyle is a photographer by birth, craft and art form. Located on 1438 Kona Street, across the street of Ala Moana Shopping Center, Fitted Hawaii is a hat boutique that puts out product with strong cultural stories behind it. There’s a lot of careful thought, knowledge, historical facts and branches from different cultures here that go into making a great product here behind the doors of FITTED, and they’re committed to giving the people quality product versus an inferior product that’s missing it’s soul. Hours of operation: Mon. – Sat. 11 p.m. – 7 p.m and Sun. 11 a.m. – 5 p.m. Phone numbers: (808) 942-3100 and (808) 942-3188.